The Pecan Restaurant is located in College Park, Maryland. Close proximity to the rail station and the airport makes this small, upscale restaurant popular among residents and tourists alike. The restaurant and bar are intimate and nicely decorated, making the atmosphere ideal for date night, a business dinner or a meal on a long layover. The menu at The Pecan consists of beautifully presented Southern-style dishes with an upscale twist. 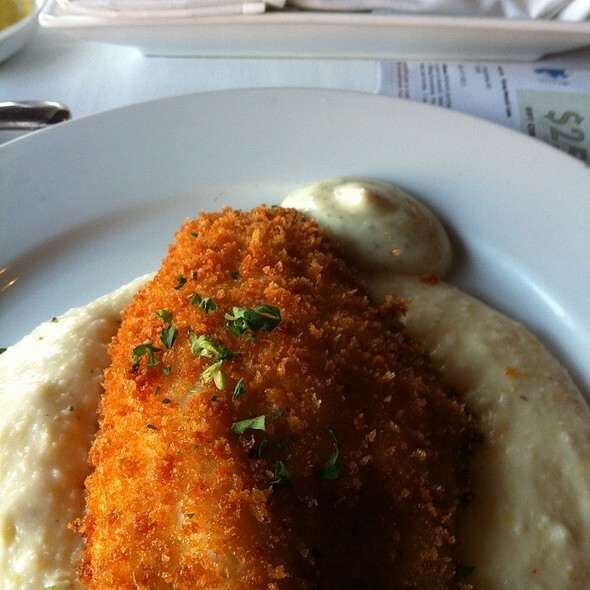 Popular items include the catfish and the crab cakes served over grits or mashed potatoes. Try the salad served with pears and blue cheese for a tangy twist. No meal at The Pecan is complete without its namesake pecan pie. Private dining for 10 or more 5:30pm -10:30pm Sunday and all day Monday. Additional Parking is located behind the restaurant. Marta stops in College Park, and restaurant is only 5 minutes walking distance. the Pecan were close indefinitely with a sign on the door. Sean our waiter was extremely knowledgeable about all the items on the menu and even suggested some items that were not listed on the menu. The food that came out looked and tasted fantastic. Next time I'm in Atlanta I will be going back there for dinner with out a doubt. My husband and I enjoyed the food, however it was overpriced. The pasta & shrimp was $30 as well as the shrimp & grits. The pasta dish was very bland and I would not order it again, they should include mushrooms, etc as toppers. Our server Kalah, was very attentive. The appetizers and mini corn muffins were delicious! Great food, good and friendly service can't wait to go back again!! We visted the pecan on 2/14/2016 at the recommendation of a few coworker who stated that the food was good. My husband and I enjoyed the food, however the service was horrible. We almost left. Once we walked in the door we had to wait about 5 minutes before being greeted. Then we had to wait another 10 before being seated. The restaurant is not that big and there were several empty tables. Then we waited about 30 minutes for our food. After being seated we waited about 15 minutes before a server approached our table. As we waited for our food, we saw several people come in and experience the same thing. At one point I called the hostess over to remind her that a couple who had waited about 15 minutes to be seated was waiting another 15 minutes and no one had approached their table. Patrons had to run the servers down to get a menu and to simply take their order. The most disturbing was an elderly couple who were there when we got there. They complained about their service and was never really given a server. At the end they waited about 20 minutes for their bill. They stood at the door with coats on waiting for there bill. We saw three servers and only bus boy. The only thing that made this experience pleasant was our server, he attitude was great. She informed us that she is not a server, she is the bartender and was just helping out. They place needs more people like her. My husband and I are residents of South Fulton and we were looking to try out new restaurants in our area. I discovered the pecan through the South Fulton magazine that we receive monthly in the the mail. We went for our date night, the service was awesome. I made reservations and when we arrived we had no wait time and they gave us the best seat in the house (a corner window nook) it's was so romantic and the ambience was perfect. The food was amazing! The seafood wontons,OMG!!!!!! The only complaint I would have is that the front door kept getting jammed and cold air would blow in making it a little uncomfortable. My husband had to get up twice to close it every time someone would come in. Other than that awesome place. I have visited the restaurant for the 3rd time now and the food and service has been exemplary each time. If you want a good meal with great ambiance the Pecan Restaurant is it! We were very impressed with the overall quality of the food, starting with the appetizer sampler that was recommended by our server; it was great! The restaurant itself was obviously dated and there were tears in the bench seating. The service started out a bit slow (probably due to a very large party being there), but improved throughout our dinner. Overall the experience was very good and I would return again if in the area. Heard about The Pecan from several people, so took a customer there who said they thought it would be fun. The waitperson, "Z" was friendly and greeted the table nicely. After that the service dropped off. There was a huge group in 1/2 of the restaurant, and it seemed they were a bit busy with them. After taking our order where 2 at our table ordered the special, Z had to come back to tell us they no longer had the special. The wine list was limited, but it seemed no one knew much about it, and it took a while to get the drinks. Our main course took quite a while with mine being delivered 5 minutes after the rest of the table. Food was good and enjoyable, but not great. Overall, glad to see the development in College Park and would try the restaurant again. Good food and friendly staff, but the wine list was terrible. Arrived on time for reservation and seated promptly. 15 min later hostess asked if we had been seved by anyone and she took our drink order. Another 15 min later , as we were about to leave the waiter showed up and still no drinks. Pretty much how the night went from there. The food was great. Excellent job on Lamb chops and ribeye both perfectly cooked, nice job to the kitchen staff and Chef. We were never offered another drink so went somewhere else for dessert and drinks, would have loved to stayed there but the service was too frustrating. Our recent night at The Pecan was memorable. Everyone found something they loved on the menu. We shared a seafood appetizer (lobster, shrimp and crab meat in a fried wonton with a sweet and spicy sauce - yummy!! We each had wine, but opted to skip dessert. Our tab was around $100 before tip. For the quality of food and outstanding service, I felt it to be very reasonable. Would HIGHLY recommend it to one-and-all. Classic starters and entrees keep me coming back, especially the carrot/ginger soup, the pecan-crusted chicken on sweet potato mash with green beans, and excellent crab cakes that abound with chunks for crab. Plus there's selections of savory mini muffins and biscuits instead of bread that are irresistible, especially when warm. Daily specials keep add variety to tried-and-true delicious dishes. Prices are not exorbitant, but still above average. And yet the QUALITY remains consistently high, thus the value is indeed very good. Also, you don't have to pay to park close to this eatery...another plus to consider. Our server on this occasion was entirely pleasant, welcoming, knowledgeable, cooperative, and attentive. wine list is way below par on items you want to charge 4 x the price of a bottle bought in a wine store. selections could be much better. price was expensive for what you recvd. Always great service. Food served piping hot and awesome specials to select. Delicious peach cobbler! I have visited The Pecan several times for dinner. However, this was my first visit for lunch to celebrate my birthday.The menu selection was large. Some dinner items were also on the lunch menu. So I was able to enjoy the curry carrot ginger soup, my favorite. Our server was knowledgeable and attentive without being overbearing. Great experience!! The Pecan is a true part of College Park history. Shortly after walking into the restaurant, your eyes will be treated to a classic Coke advertisement on the wall to the left. With a reservation confirmed, myself and my guest were escorted to a window table set for two. The service was top notch. Our server was clear and knowledgeable about the menu, with attention to all our needs, be the details of our order to making sure our drinks never went dry. I ordered the Pecan chicken and my guest selected the shrimp and grits. Both dishes were excellent. While the bill may be a little high for my taste, the evening at the Pecan is worth a look for people trying to make an impression with friends or family. Generally I have found the restaurants near the Atlanta airport for be average at best. This one is a gem! The waiter made us a special appetizer of fried lobster that was phenomenal and the salmon was excellent! Drinks and wine was a perfect compliment. I will be back the next time I'm in Atlanta and will recommend this restaurant to everyone I know that travels to Atlanta! Thanks to our waiter who was terrific! I have NEVER had a bad meal here and have eaten there for 10 years. I would rank it with some of the best restaurants in Atlanta! Always good service, too. Despite side walk construction, we were able to get into this fine treasure! From the moment we entered to the moment we left, the service was perfect. The choice of menu were perfect, and out lunch was cooked to perfection. We will be back! I was meeting a business associate that was staying in a hotel close to the airport and wanted a nice restaurant for dinner. This was a GREAT find! It is in an older area of College Park but easy to find and easy to park. The service was excellent with the waitress being very responsive. The food was excellent. 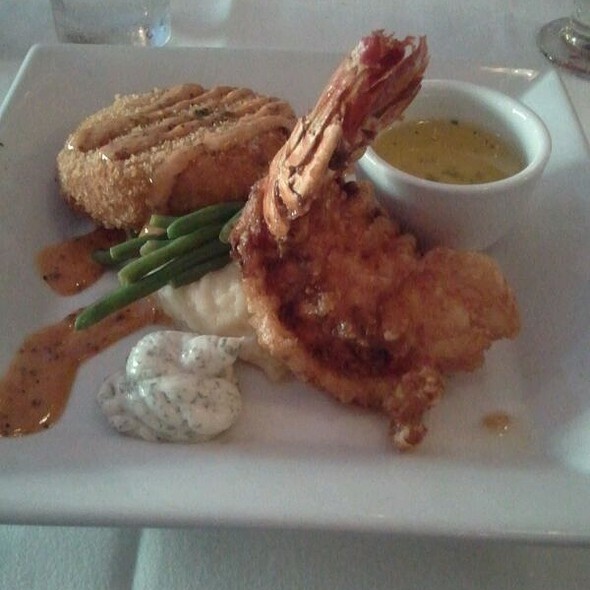 I had the blackened shrimp with grits and my associate had the Crab cakes. We agreed that both dishes, while on every southern traditional menu, were among the best we had. I will definitely remember this restaurant and go again.....even without needing to be in the airport area. We waited 30 minutes after being seated for the waiter to ask for a drink order. We waited one hour and a half for the waiter to take our order and he only came by because I flagged him down. We didn't have a ton of time so we ended up having salads and no main course because of the lack of service from the wait staff. This is the second time I've been and both times the service was awful. I hoped that last time it was just a bad night because the food is great but it seems to be the norm. I will not be back again. This place never disappoints me... it is pricey, but it is really good. Food was awesome! Service was fantastic! Location was charming! Our service from the waiter CJ was impeccable. He was very attentive and his side selection was perfect. We thirdly enjoyed the food and service. Excellent Sunday brunch. Service and food very good. The Pecan was an interesting dining experience. The food was very good. The service was adequate (in defense of The Pecan, there were 2 large groups). The Pecan is one of those restaurants that is trying to figure out who and what they are - located in an old building in an old town at the end of a runway of the Atlanta airport - it's a tough situation and they are making the best of it. It's just on the edge of being something really special - they just haven't arrived yet! We had dined here a couple of years ago and were very impressed by the delicious meals we had. This visit was not as good. Service was not first-rate (slow, somewhat inaccurate), dinner was good but not outstanding. We didn't go overboard on ordering, only one person had wine and we shared one dessert -- and bill was over $240 for our party of 3. This is really high for the caliber of food/service that we received. We were disappointed that our meals were not as good as at our previous visit. Well located for those staying at ATL airport hotels. Great service, a neighborhood gem and a great food. Try the drink, "Tony Morrow". This was my second time dining at The Pecan. I enjoyed my meal but it wasn't overly memorable. The prices are on the high side and for those prices I expect silverware service, which didn't occur. My server thought it was ok to use my salad fork for my lamb chops and I had to ask for a proper knife. If you've never been I would say go. But if you are a foodie and looking for an exceptional meal I would skip this one. It's good but not great and for the price I need great! Always a great spot. Food is good however the menu is always the same and almost everything is fried. Wish they would bump up their offerings. We greatly enjoyed our experience last week, from the attentive, crisp service by our waiter to the delicious cuisine and desserts. We would definitely go back. I have a great meal everytime, The Pecan is definitely in my top 5 places to eat in the Atlanta Metro area. Excellent restaurant. Amazing food. Great staff. Will gladly return!! !